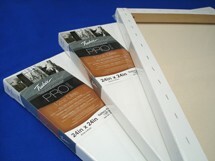 Professional quality pre-stretched canvas imported from US manufacturer Fredrix. Wood: 36mm deep (1.5 inch) keyable wooden stretcher bars made from US grown Ponderosa Pine. Canvas: The famous Dixie canvas - Extra heavy-weight 12oz cotton duck with an acid free acrylic / titanium priming for oil and acrylic paint. Stapled at the back, clean edge. We think these canvases are the only ones on the market that are truly professional quality. The canvas is the same kind we use for our Extra Heavy-Weight canvas, so you can feel sure you are painting on a quality product. With so many cheap Chinese canvases on the market it is important for the artist to know exactly where their canvas comes from.